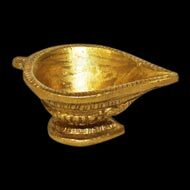 We at Rudra Centre offer a wide range of brass sacred items and gifts online. In Vedic literature, metals such as silver, gold, brass etc. plays an essential role. These are not just metals but considered as sacred items. And why are they called sacred? Because they are used in serving the deities worshipped at the altar. The Rasayan Shastra (a Vedic treatise on Chemistry) describes the hidden powers of various metals. Metals like brass have mysterious properties. Sushruta Samhita (a Vedic treatise on medicine & surgery) underlines the significance of Alkalis that helped the surgeons during Vedic Age remove the diseased parts of the human body. The same was used in cleaning the instruments used in surgery. It means metals when treated properly act as anti-malign agents. The physical properties of metals such as brass can be influenced by the sound of Vedic mantras. Brass is made of copper and zinc. In spirituality, copper is the metal of Venus. Therefore brass to an extent shares the spiritual or cosmic qualities of copper that are associated with charisma, beauty, artistic creativity, and harmony. 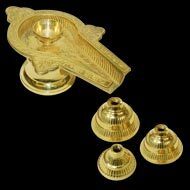 We have brass items used exclusively in Hindu pujas. These items are made from brass made of the finest quality. A Vedic puja is not just about offering prayers but pleasing the deities with offerings of the finest quality.